This post may be sponsored or contain affiliate links, but all opinions are our own. We are a participant in the Amazon Services LLC Associates Program, an affiliate advertising program designed to provide a means for us to earn fees by linking to Amazon.com and affiliates sites. Use a spoon to mix together 2 sticks butter, brown sugar, granulated sugar, eggs and vanilla in a large bowl until well combined, but do not overmix. In another bowl, combine flour, baking soda, cinnamon and salt. Mix flour mixture into butter mixture, being sure not to overmix. 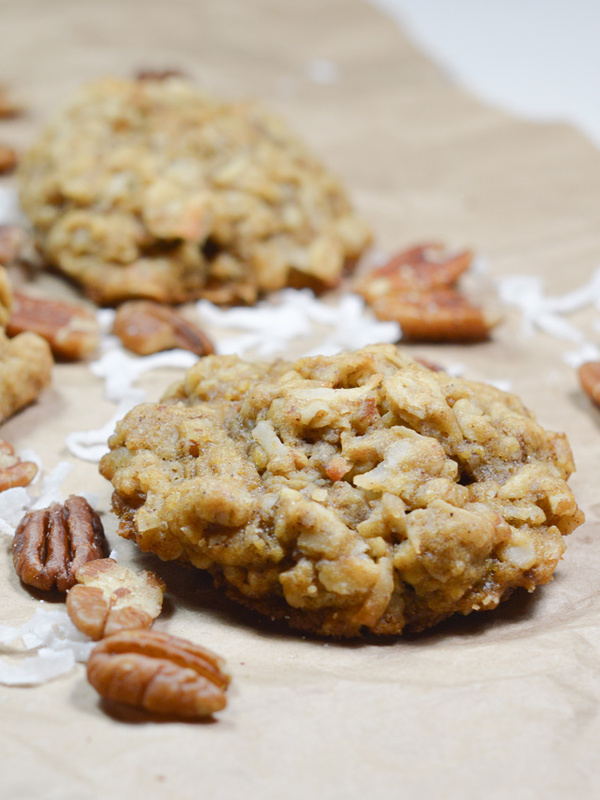 Mix in oats, pecans and coconut. Grease baking sheet with 1 tablespoon butter. Roll dough into balls, approximately 1¼ to 1½ inches in diameter. Place dough balls onto baking sheet. Bake approximately 12 minutes until cookies are light golden brown. Recipe yields 3 dozen cookies. 0 Response to "OATMEAL COCONUT PECAN COOKIES"